I'll be hopping in and out of #AMonthofFaves this month with some book-related and not-so-book-related content. Today's prompt: Weekend Reading -- Picking Favorites Shared through A Month of Favorites this week. Andi also has me even more excited than I already was about the forthcoming The Lifechanging Magic of Not Giving a F**k, which is out from Little, Brown in December. Cannot. Wait. 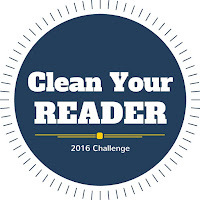 In non-Month of Faves news, it's not too late to sign up for the Clean Your Reader challenge this January-March. The premise is simple: focus on reading all those unread e-books lurking on your e-reader accounts somewhere. I hope you'll join us!